Tablescape Thursday for the Over 60's. I'm not sure if this post really qualifies for Tablescape Thursday over at Between Naps on the Porch, but I hope so. 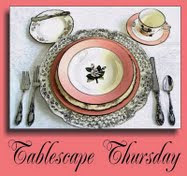 Please join Susan our gracious hostess for more delightful tablescapes today. When I was a little girl my Nana B belonged to the Over 60's Club. They went on coach trips, played bingo & had beetle drives. Anyone else remember those? Imagine my horror when 2 years ago my DH became eligible to join "that Club". In the tiny commune where we live turning 60 meant that he and his wife were invited to the annual "repas des anciens". A luncheon provided for the Over 60's in the salle communale (village hall). Twice we made our excuses, however this year when Remy "Monsieur le Maire" arrived at our door with the invitation what could we do but accept graciously? To our delight we had a wonderful time. The autumnal floral decorations were unique, I think you'll agree.The walking stick arrangement was perhaps a tongue in cheek homage to the occasion? 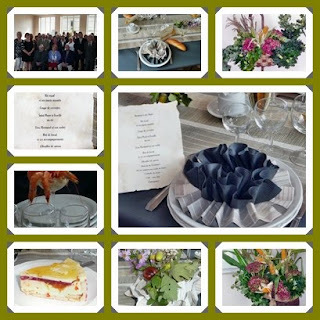 The excellent seven course luncheon was catered by a local traiteur and the ladies of the village led by the Maire's wife were superb hostesses, anticipating our every need. 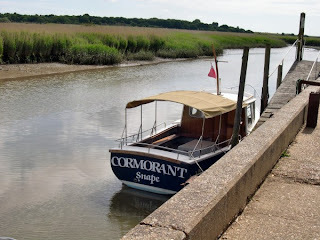 By the way I recently posted about a 3 hour lunch that we enjoyed by the sea, the oldies lunch began at 12.30pm and we were the first to leave at 6.00pm. 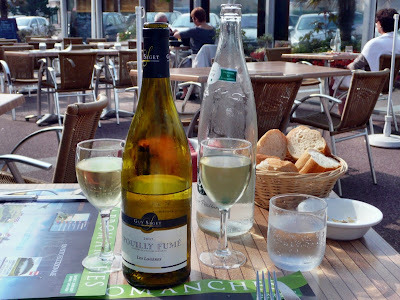 I hope you have enjoyed this glimpse into the social life of a rural Normandy village, we certainly had fun. Outdoor Wednesday seems to coming around even quicker than before now that the days are getting shorter. 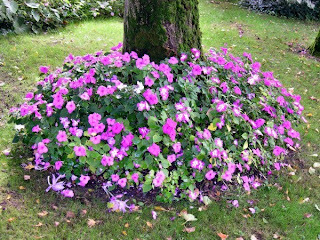 Please visit our gracious hostess Susan @ A Southern Daydreamer for more delightful Outdoor scenes. Even though there is a chill in the air in the early mornings the days are bright and sunny and so it was on Sunday. 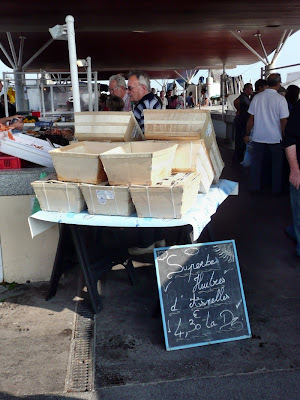 After mooching around the Brocante in Le Molay Littry and before attending the Over 60's lunch at the village hall (more about that later this week!) 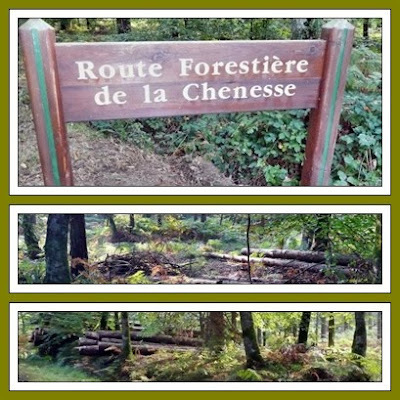 the DH & I took Ben for a good long walk in the Forest de la Chenesse. When we drove up to our, usually very quiet, parking spot we found lots of people milling around, they seemed to be getting ready to ramble through the woods or go picking mushrooms or both. Too busy for us, so we drove off to find a quieter spot. Have you got your comfortable walking shoes on? Is your dog on his lead? The sun was shining through the leaf canopy and all we could hear was the sound of the occasional bird. 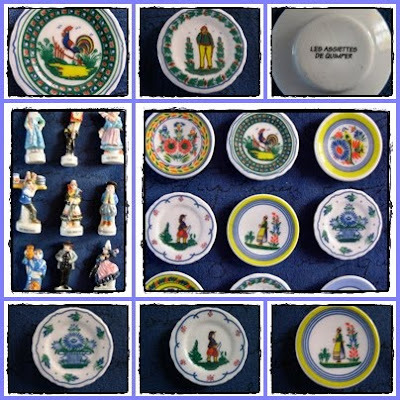 Yesterday we visited a brocante/flea market in a local town, ever hopeful of finding a treasure or two, perhaps a rare piece of Quimper faience?? 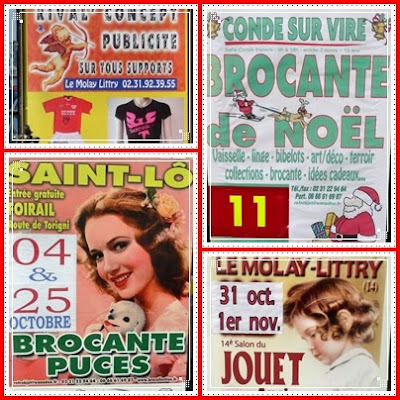 We came away empty handed but I did get some pix of posters advertising upcoming brocantes, I love their retro style. I'm a little late getting this done for today's Mosaic Monday over at Mary's Little Red House but please do visit our gracious hostess and all the other wonderful mosaic makers gathered there. 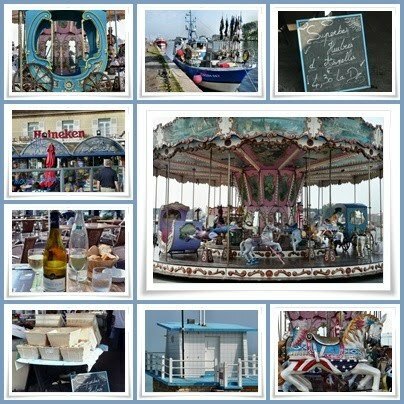 and watch the carousel go round.................... just another beautiful day in Normandy. A collection of fèves for Three or more Tuesday. It's Three or more Tuesday over at Tam's The Gypsy's Corner, a great show & tell party that's a treat for the eyes. So, today I'm showing off my collection of fèves. Followers of my blog may have gathered by now that I collect the French pottery known as Quimper faience. Yes, really! You probably also know that the 10th Annual meeting of the QCI will be taking place next month in Dallas. Click here to go to the QCI Blog to read all about the fun in store. I have attended the past 9 meetings, starting with Washington in 2000, up until Philadelphia last year. 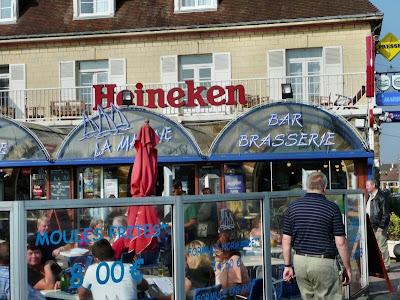 I even co hosted the 2007 meeting here in France and will be co hosting again next year in Savannah, Georgia. The meetings are always great fun and a wonderful way of connecting with fellow collectors and meeting up with friends discovered through our shared love of Quimper. The Grand Finale of these events is always the Farewell Dinner and in recent years each guest has received a small party favour of fèves (epiphany trinkets) as they take their places at table. In France “La galette des Rois” ("the king's cake") celebrates the Epiphany and is traditionally sold and consumed a few days before and after January 6 (although today in France, it is available in bakeries for the entire month of January). The cake consists of flaky puff pastry layers with a dense center of frangipane, raspberry, apple, and other flavors, as the baker is inspired. 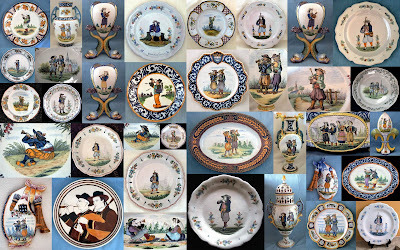 The "fèves" are generally produced in theme series, with every possible theme imaginable, including Disney figures, regional motifs, ceramics, antiques, every aspect of modern life, etc. They have become very popular collectibles and can often be bought separately. Any series is generally produced for one year only. For several years the fèves presented at the Q Club dinner were tiny figurines of Breton people. In 2008 our gift was a tiny plate decorated with a traditional Quimper motif. Over the years I have accumulated quite a collection of figurines and I was so enchanted by the little plate last year that I purchased the complete set. The series of Quimper plates was produced for Epiphany 2008. It consists of ten pieces, each a miniature reproduction of a real Quimper plate, either Henriot or HB. Many "fèves" are titled, and these are marked "Les Assiettes de Quimper" (The Plates of Quimper) on the reverse side. You may not know this but I am also what is laughingly known as "blogmistress" over at the Quimper Club International blog. 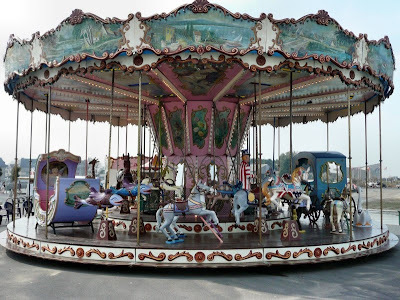 For Charis' Sunday Favourites I reprised a post that had appeared on the QCI blog back in June. 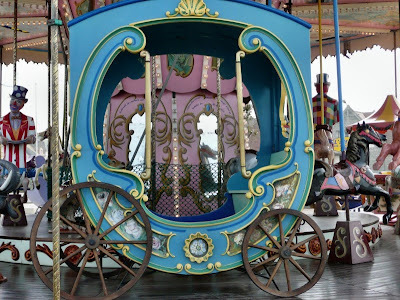 Written by leading Q expert Adela Meadows it was a fascinating insight into the ever popular Quimper decor of biniou & bombarde players and the history and traditions behind them. I got so caught up in the whole musician theme that I created this collage of pictures from my personal archive of Quimper pieces that I have enjoyed, to share with you all today for Mary's Mosaic Monday @ Little Red House. It's pretty full, so you may want to click on the pic to enlarge in order to enjoy these wonderful handmade and handpainted treasures of Breton heritage. After you have finished drooling over these beautiful treasures head on over to Mary's where you will see some truly wonderful Mosaics created by a bunch of people a lot more talented than I.
Whilst meandering around blogland recently paying visits and going off at tangents, as you do, serendipity led me to Keetha's blog Keepie DaNiece's Eclectic Stuff. Well, as if the blog title wasn't enough to grab my attention the header photo stopped me in my tracks, Gull Lake, Washburn County, Wisconsin. 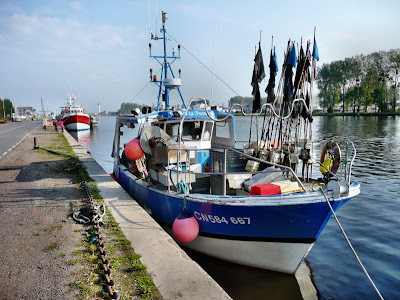 Over the years DH & I have travelled far and wide across the United States but have not yet made it to Wisconsin, so I decided to sit a while and see what Keetha had to blog about. Straightaway, I discovered that Lori E, who is also a follower of my blog (clever woman), had just designated Keetha as a Superior Scribbler. This award began last year over at the Scholastic Scribe where they keep a list of all those who have accepted it. Keetha had decided to bestow the award on the first 5 people commenting on her post. By the time I read the blog it was too late, I was #6! Quelle dommage! 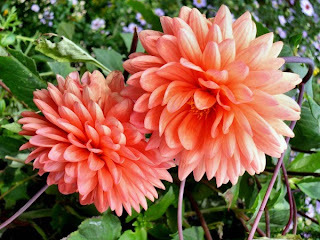 But, after visiting my blog, Keetha invited me to take the award which I did toute suite before she changed her mind. Now, I get the chance to tell you about 5 great blogs that I follow and the women behind them, all of whom, I think, deserve this award. Jackie, @ Jackie's life in Surrey is always visiting beautiful places around the U.K. and I love to visit them with her, through her words and photographs. Almost makes me homesick for dear Old Blighty. Carol, @ Serendipity does make me homesick for Maine "The way life should be". I have the T shirt but not the life, Carol does and she doesn't mind sharing it with me. Suzanne @ Coloradolady hosts a fabulous Vintage Thingies party every Thursday and it's a party you really would like to be a guest at. Because of this blog I have discovered a whole new world of "cabinet" cards. Mary, @ The Little Red House opened my eyes to the beauty of mosaics and encourages everyone to join in the fun with her Mosaic Mondays each week. I've still got a lot to learn from her but armed with a new camera and her tutorial my technique is bound to improve. And last but by no means least, Jane @ Mamie Jane's is a talented lady. She has such an eye when it comes to creating gifts and home decor projects, mostly using flea market and thrift shop items. She shares the "how to" with us with stylish ease, makes me want to run out and make something myself. Please visit these great blogs and be sure to tell them I sent you, you'll have fun. Each Superior Scribbler I name today, if they decide to take the award from my sidebar, must in turn, pass The Award on to 5 most-deserving Bloggy Friends. • Each Superior Scribbler must link to the author & the name of the blog from whom she has received The Award. • Each Superior Scribbler must display The Award on her blog, and link to this post, which explains The Award. • Each Blogger who wins The Superior Scribbler Award must visit this post and add his/her name to the Mr. Linky List. That way, we'll be able to keep up-to-date on everyone who receives This Prestigious Honor. Each Superior Scribbler must post these rules on her blog. 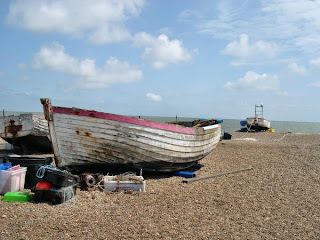 P.S the pix today are from our last visit to the UK, in June, when we discovered the seaside joys of Suffolk. Today I'm linking up not just with Vintage Thingies Thursday over at Colorado Lady, Suzanne's place but also with Gina @The Shabby Chic Cottage for her Transformation Thursday get together and thought I'd tell you a little about the doors that hang between our dining room and kitchen in the 18thc part of the house. Original to the house they were in a terrible state when we inherited them 13 years ago. By the way, in case you were wondering, these are the "after" pictures. The look is not to everyone's taste I know, but for me they are the epitome of shabby French chic. In an effort to make them " keepable" I stripped off many layers of old paint, treated for wood worm and replaced two of the panes of glass with some I found in the outbuildings but two others remain unfilled!! Since I still haven't found door knobs that I like. the empty space facilitates opening and closing the doors! I had a carpenter re -hang them, so that they "swing" to & fro, rather like saloon doors in the Old Wild West. The sides facing the dining room have carved panels on the lower half, the kitchen sides are not as fancy and you can see where they have been reinforced, at the corners, over the years. How old do you think these doors are? This is the date that I uncovered under all those paint layers: 1840. That's right they are 169 years old, I love them as they are and will never repaint them, but would you? 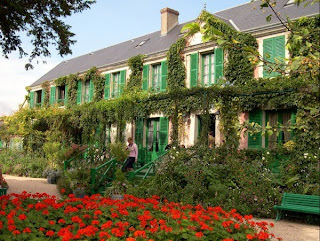 Claude Monet's garden at Giverny in September. 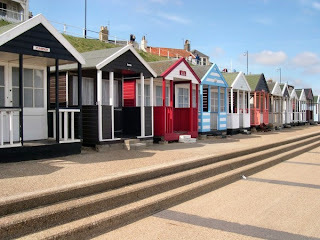 How quickly Wednesdays seem to come around nowadays, one appointment I always like to keep is with Suzanne @ Southern Daydreamer and her Outdoor Wednesday gathering. 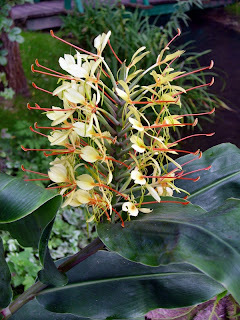 Do go over and visit with Suzanne and enjoy the other outdoor glories she has gathered today. 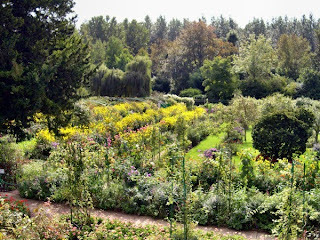 Today I'd like to take you on a September tour of that beautiful garden which I so love to visit. 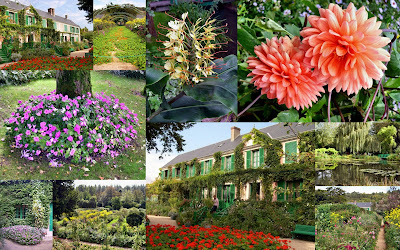 It never seems to matter what time of year I am there, the grounds are always a delight and another tour of the house is de rigeur. 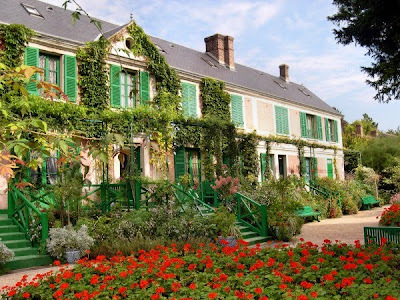 Bequeathed to France's Académie des Beaux-Arts by the artist's son Michel in 1966, Claude Monet's property at Giverny has since undergone major restoration. With its pink render on the outside, the house where the leader of the Impressionist school lived from 1883 until 1926 has now regained the colourful interior and intimate charm of those bygone days. 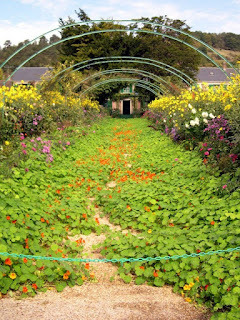 Several of its rooms are now devoted to the artist's precious collection of Japanese prints, hung in accordance with the instructions of the Master of Giverny. 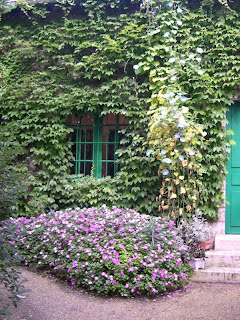 Just a few steps from the house the restored Water lily Studio, is now home to the Monet Foundation shop. 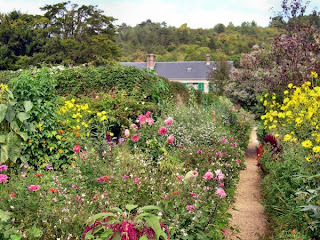 Also restored to their original state, the gardens now offer the visitor that "painting made from Nature itself" that Monet's contemporaries regarded as one of his masterpieces. The house and studios look out on to the geometrically designed Clos Normand, whose stunning flowerbeds are surrounded by arbours of climbing plants. From spring through to autumn the Clos is the setting for the changing palette of a painter-gardener who was "simply mad about flowers". 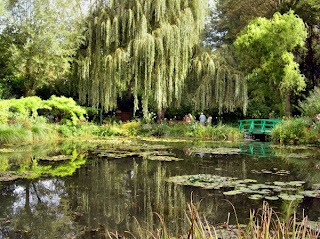 Further down, a man-made, willow-shaded branch of the river Epte feeds the Water Garden with its celebrated Japanese Bridge and its wisteria, azaleas and pond. Once again this spot has become that meeting of sky and water out of which emerged the pictorial world of the water lilies. 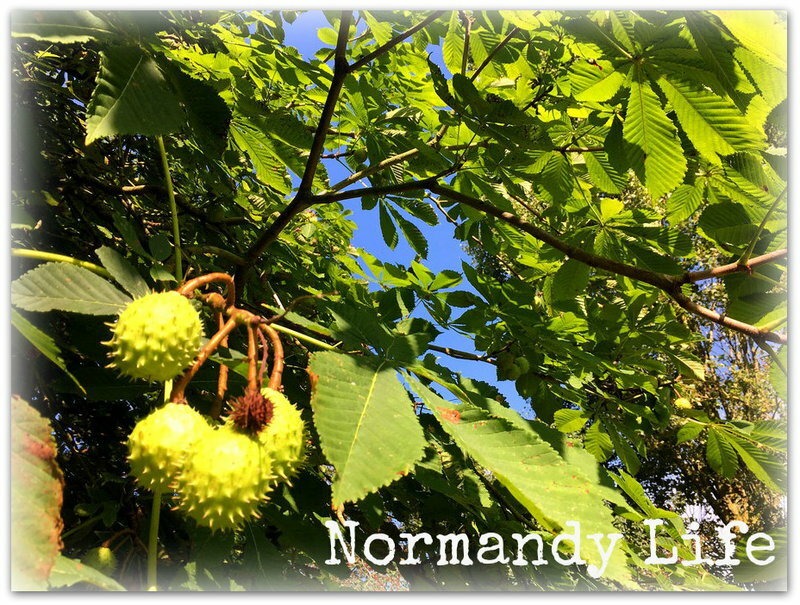 I hope that you have enjoyed your virtual tour with me today and perhaps one day, if you plan a visit to France and visit Normandy, we can go there together, once again.